Modern culture prevents many of us from engaging in a critical part of our human heritage—developing a sacred relationship with food. I’ve talked about developing such a sacred relationship with food on this blog before with regards to growing it and/or foraging it—how gardening allows me to develop a sacred relationship with plants, how seed saving and starting completes that cycle, how wild food foraging and medicine making allow for that connection, and how locally-based seasonal diets can help reconnect us. However, I’m staying with my family for a few weeks before making my official move to PA, and trying to eat as I usually do (locally, seasonally, organically) has presented some serious challenges. The truth is that in poor, rural areas in the USA, organic and local food is simply not as available (or affordable) as it is in the cities or suburbs. In other places, poor areas of cities may also have no access to food. Where my parents live, farmer’s markets are practically non-existent out here, at least that I have been able to find. When I went to purchase some food I can get locally in Michigan, the markup around here was incredible ($12 for a tiny jar of tahini (not organic) compared to a much larger jar of organic tahini for $6 in Michigan, $2 for a single organic orange (compared to a bag of organic oranges for $3.99, $4.99 for gluten free noodles (also not organic) compared to $1.99 organic brown rice noodles, and so on. I was used to paying half of that for these kinds of staples, even in a much more expensive and wealthy area. So, given this situation that I’m seeing here, I’m using this blog post to explore other options for creating a sacred relationship with food that doesn’t have to do with the procurement or purchase of food itself. The question is, what can we do to honor our food if buying local and growing our own food is off the table? This post explores other ways we can use prayer, ritual, and celebration to help bring the sacred back to our food—of any origin. Special food created for a ritual feast! With the blessing of the earth, I honor the lands that sustained this meal. With the blessing of the air, I honor the hands that prepared this meal. With the blessing of fire, I honor the labor that produced this meal. With the blessing of water, I honor the lives that were given for this meal. With the blessing of spirit, I wish a safe journey to those who now move on. In gratitude, love, and peace, I recognize that all are part of the great web of life and that I, too, will one day return. Another simple “prayer” was taught to me by a friend who runs a sustainable living center, Strawbale Studio. She has people of many faiths and traditions visit each month for full moon potlucks and began doing a simple physical energy blessing. Since nothing is said during this prayer, its very appropriate for mixed groups, and it works surprisingly well on its own. Start by rubbing your hands together, generating heat and friction. After a few moments, when you feel your hands tingling, place your hands over the food and send the positive energy that you raised into the food. Then, move your hands outwards to face any others in the room, sending positive energy in their direction. Finally, sweep your hands above your head and circle them down to the earth below to bless the land and all its inhabitants. 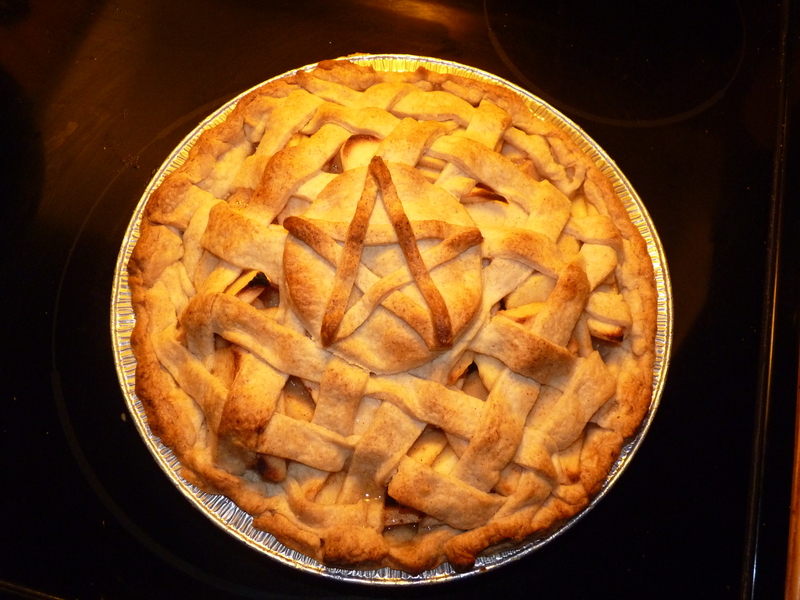 A special and protective apple pie, baked for a friend as a housewarming gift! And yes, it was the best pie I ever made! I like to give others the blessing of an extra special home-cooked meal or beautiful and tasty dish for difficult times or special occasions. This was once a common thing–to bring an elderly or sick neighbor a hot meal, to show up on a new neighbor’s doorstep with freshly baked bread to welcome them, or even to give food as gifts for fiends and family. I like to continue this tradition as much as possible. Even this simple little gesture really brings a sacredness to the food, showing them that you were willing to cook it, to think of them, to bring it to them. 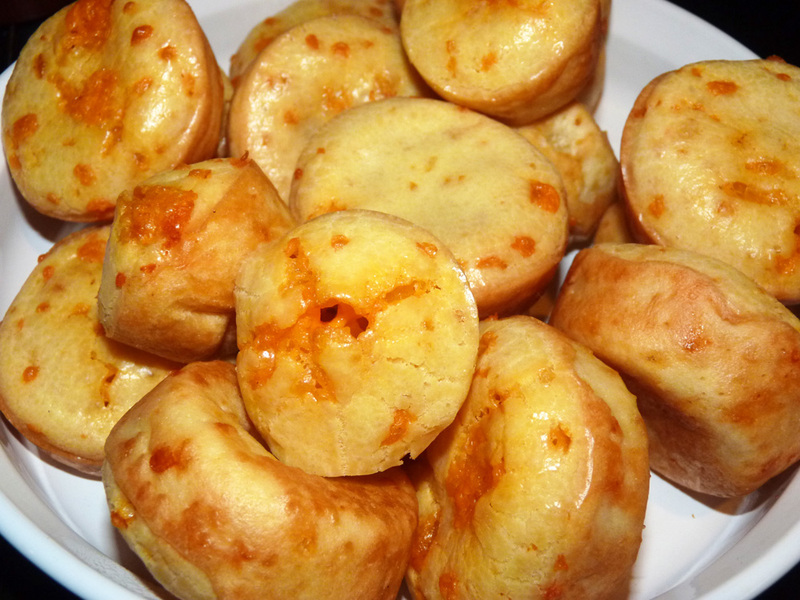 This kind of food is appreciated so much mroe than normal food–it lends a positive energy to the whole experience. Traditional cultures had many blessings for the land—in fact, this is where most of the festivals associated with the Wheel of the Year came from—all had something to do with the crops, the livestock, the harvest, the dark and cold times. But for now, let’s look at some specific ceremonies that anyone can do and that function as land blessings directly tied to our food system and lands that produced them. Many traditions had blessings specific to treecrops and harvests. For example, Native Americans blessed maple trees in the late winter before the sap ran to ensure a good maple sap harvest (given that maple sap was one of their only sources of sugar, it was a very important harvest)! Dancing and erecting a maypole is also a wonderful way of bringing fertility to the surrounding land. In the United Kingdom, Wassail traditions were used to bless apple orchards to encourage bountiful apple harvests—again, apple was a critical crop for both food and drink. This is a tradition that I’ve been blessed to participate in while living in Michigan. Wassail ceremonies can also be adapted more broadly to honor all of the food-bearing plants on the land—and they very much appreciate the positive energy such a ceremony provides! I think there are many places we can draw upon for inspiration to engage in land blessings—and blessing the land that provides our food is a way of honoring that food, that land, and bringing in a sacred awareness of our dependence upon the soil, sunlight, rain, microbial life, plants, bees, and so much more. Even if you aren’t eating locally, the blessing radiates outward to all life. We can begin to enact them again with our friends, family, and in our communities. This work is powerful, meaningful. The first time we put up a maypole, the land was blessed. The first year we did a wassail, the trees were piled with fruit! But we can also create simple new traditions that honor the land—and by extension—the food we eat. An example of a very simple ceremony is putting out home-cooked food for the land as an offering. I like to put out homebrew (wine or cider) with cakes that I bake especially for the ceremony. This can be done at any point, although you could time it astrologically to make an offering on the full moon (or another auspicious harvest day—any old Farmer’s Almanac will provide all such days for the year). I like to make regular offerings in this way, taking some of the best food I prepare and leaving it as an offering. 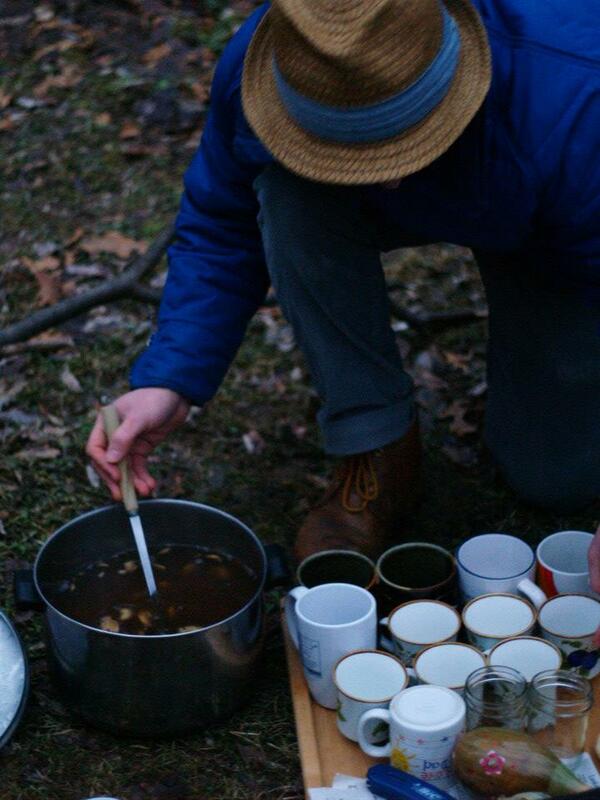 Truthfully, whether or not you draw upon an ancient tradition like the Wassail or something right out of your head is not important—the important thing is to honor the land from which all of our food flows. I think we have a great opportunity to spread “oak knowledge” by offering such blessings of the land and inviting others to do the same. The land in our world today, at least here in America, often get no such honor. Through these kinds of celebrations, we can shift our consciousness and recognizing the importance of maintaining a physical and spiritual connection with the natural world upon which our food systems and lives are based. Feasting and ceremony have a tremendously long history, and using food and the act of partaking in sacred rituals surrounding food goes back before recorded human history—in the USA, of course, Thanksgiving is our traditional ritual feast, honoring our history and seeking to be thankful for what blessings we have been given. Its unsurprising that in this massive age of consumerism, our “giving thanks” and partaking a traditional, seasonal meal has been subsumed in the consumerist hysteria of black Friday. Given this, we can again, draw upon ancient traditions or create our own traditions and rituals surrounding food. For me, at least once a year, I like to hold a ritual dinner, honoring my food, eating in silence, and simply being with it. This is usually done by cooking one of my last harvests of the year, right before I pull out the main part of my garden. I cook all my food from the garden, say prayers, make offerings, and generally just be thankful for the food and my opportunity to develop a relationship with it. A second kind of simple seasonal food ritual is simply creating a meal based on foods available at that season. Root stews with beans in the winter, greens and salads in the spring, corn and potatoes in the fall, and so on. You can create a whole menu of seasonal, special foods and recipes that you create to honor the season (and tie these with the wheel of the year). I have done this—and some of the recipes shared on this blog, like dandelion wine, are part of seasonal food preparation that I’ve done to honor the land and develop a deeper connection. While my recipes are tied locally to my land, they don’t have to be, and I think the attempt is what is important. I hope what this post has suggested is that there are many, many ways in which we can develop a more sacred relationship with food–even when certain options are closed to us. There are so many other kinds of things you can do with ritual and food—and the sky is really the limit!